Travelling around Morocco was far easier than we had anticipated. In the north, we took the train. Marrakech was the end of the train line, and by this point, we were in love with the country. We had seen enough to leave us wanting more. 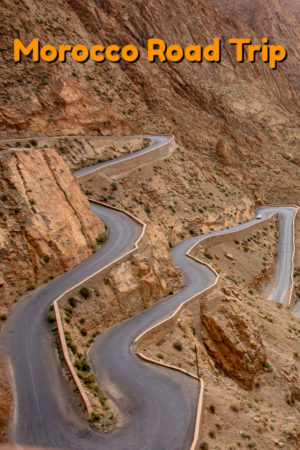 That’s when our concept of a Morocco road trip came to light. 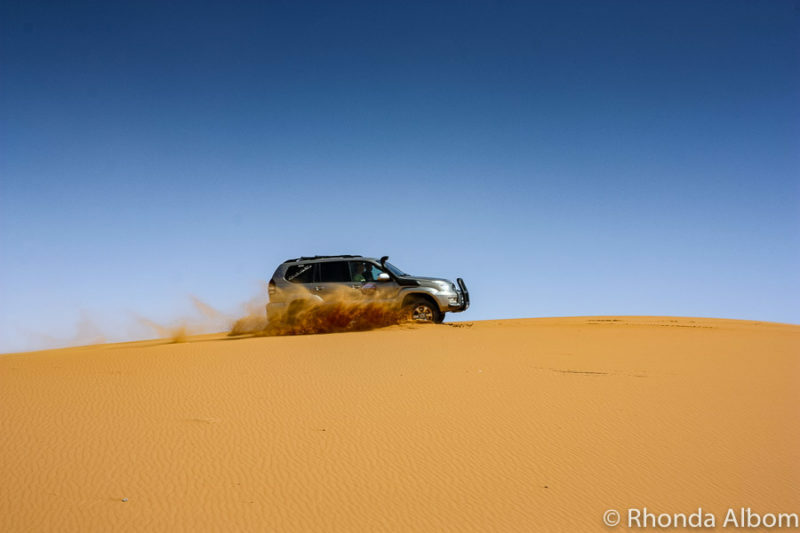 At first, the idea of driving in Morocco seemed a bit scary, but after spending a few weeks travelling by train, the concept of having our own vehicle for a road trip Morocco style got better and better. And driving turned to be a great choice. 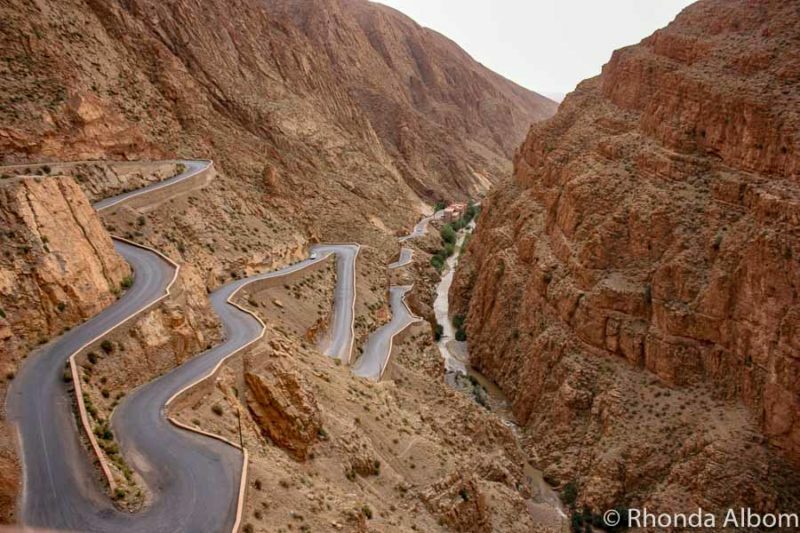 20 Have you enjoyed a road trip in Morocco? The train system brought us from Fes to Marrakech. From here we rented a car (see below for detail on this) and began the self-drive portion of our Morocco adventure heading to Essaouira on the coast, driving on a well-paved motorway. Essaouira is a piece of paradise that should be enjoyed by anyone visiting Morocco. Music lovers flock to Essaouira in the spring for the annual Gnaoua World Music Festival, while watersports lovers know it as a world-class windsurfing destination. For us, it was a place to unwind and embrace the culture. To better understand the city check out: Essaouira Beach: Sunset, Surf & Camels in Morocco and Photo Tour of the Exotic Medina of Essaouira Morocco. 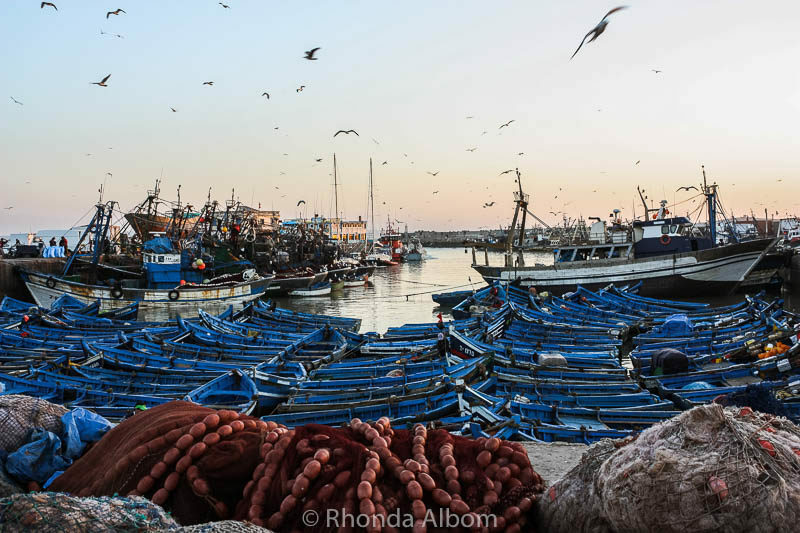 Fishing boats in Essaouira line the docks overnight. 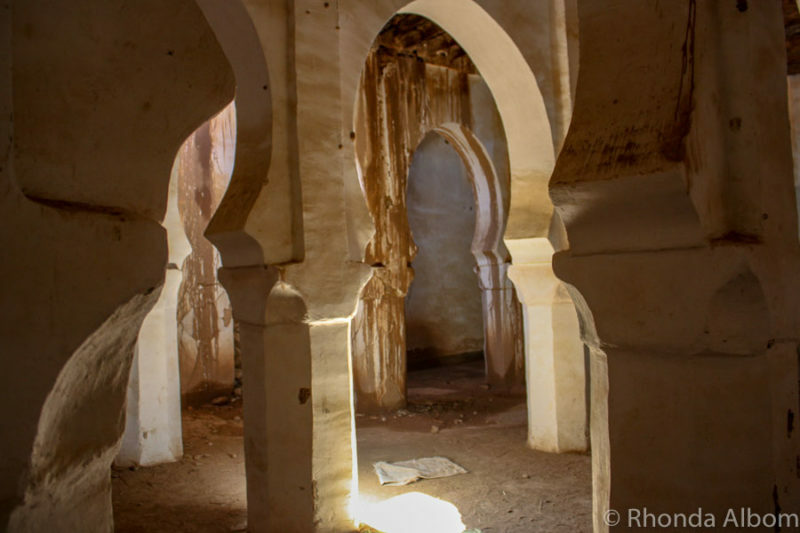 After nearly a week in Essaouira, we were ready to explore more of Morocco’s interior. We drove south, also along beautifully paved roads, to the coastal city of Agadir. Here we turned inland on the way to the Sahara desert. 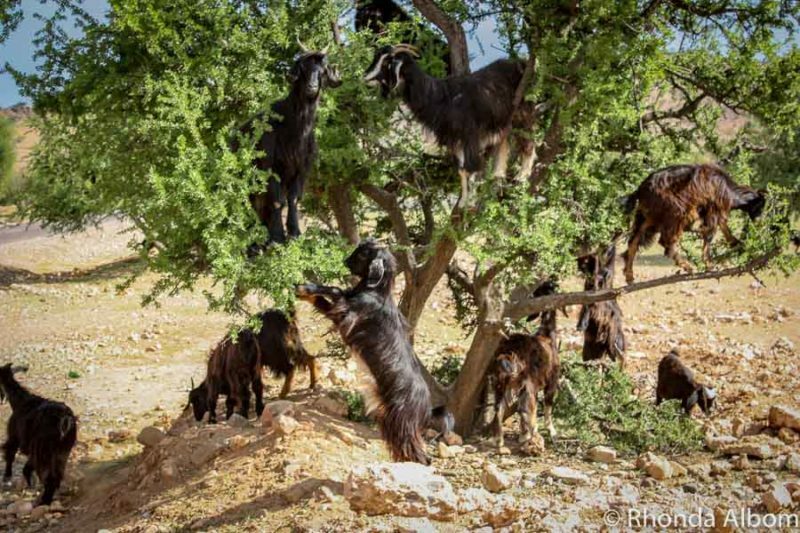 As we approached Taroudant, we looked for a shepherd tending to goats in trees, as this is the first step to making argan oil. We treated ourselves to a bit of luxury in Taroudant and stayed at the Riad Jnane Ines. The classic Moroccan architecture complemented the comfortable accommodation, and the wellness center made it a bit of paradise. Here we enjoyed a “tourist style” hammam, which was more like gentle massage and skin treatment than a Turkish Bath, and a far cry from the amusing traditional hammam we had in Fes. Our friendly host drove with us into town and guided us through the medina. As we began to climb the Atlas Mountains there was a bit of construction to the left and a man waving us to stop. He presented a dramatic story about bringing lunch to his construction worker son and now needing a ride back to Agdz, 45km in the direction everyone on this road is headed. As we approached Agdz, he invited us to stop in at his home for a cup of mint tea and dates in exchange for our generosity. Here “his family” tried to sell us carpet and other Moroccan souvenirs. We later learned that this is his “job.” Each day he stands at the construction site, flags down tourists, and brings them to the house in hopes of a sale. 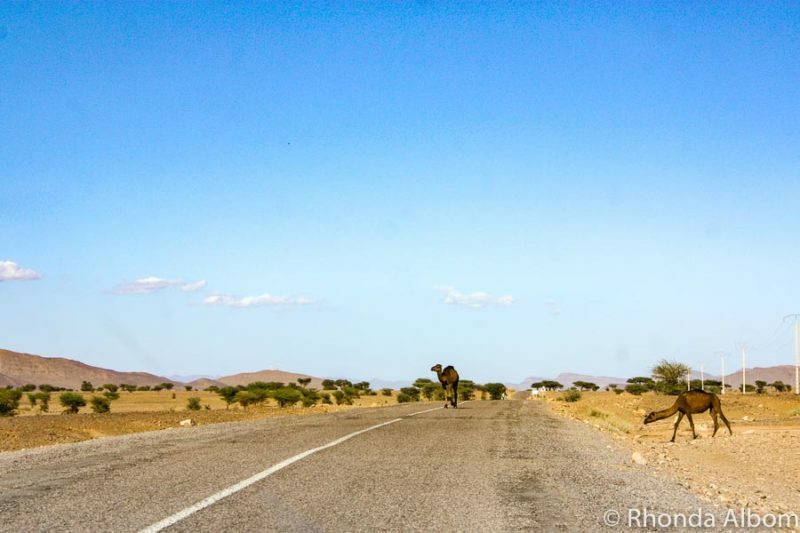 Driving in Morocco – a view out the window. Once in Agdz, the street quality had noticeably deteriorated, but not a problem for driving. We stayed in a delightful Riad that no longer exists, but didn’t do much that night as there was a massive rain storm. Before the rain pounded down on us we watched lightning strike just beyond Jbel Kissane, the tajine-shaped mountain in the distance. Jbel Kissane is one of five mountains that make up the Anti (or Lesser) Atlas Mountain range in south-eastern Morocco. The storm continued for hours, although it was nothing compared to the flash floods we saw in Oman. 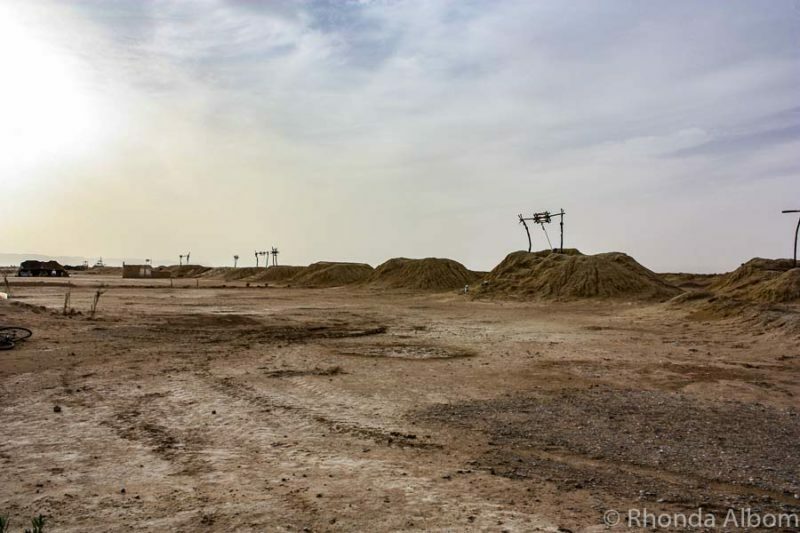 In the morning the weather had cleared, and the proprietor took us on a guided walk through the palm date oasis, and into the old Kasbah that he was restoring. Inside the Kasbah in Agdz that is being refurbished. If you are spending a night in Agdz, we recommend Maison d’Hôtes Kasbah Azul. While this isn’t where we stayed, we drove by it several times (we were lost) and each time we thought to ourselves, “wish I was staying here.” Reading the reviews only confirmed our thoughts. We often made unscheduled stops and discovered some very interesting things. We stopped at these old water wells to use the toilets. The only way to do so was with a tour, so we went into these former wells with the assistance of candlelight. Back in the day when they were used, each family was allocated a different well, but we couldn’t quite understand why, as the same tunnel that once held the water ran under all of it. 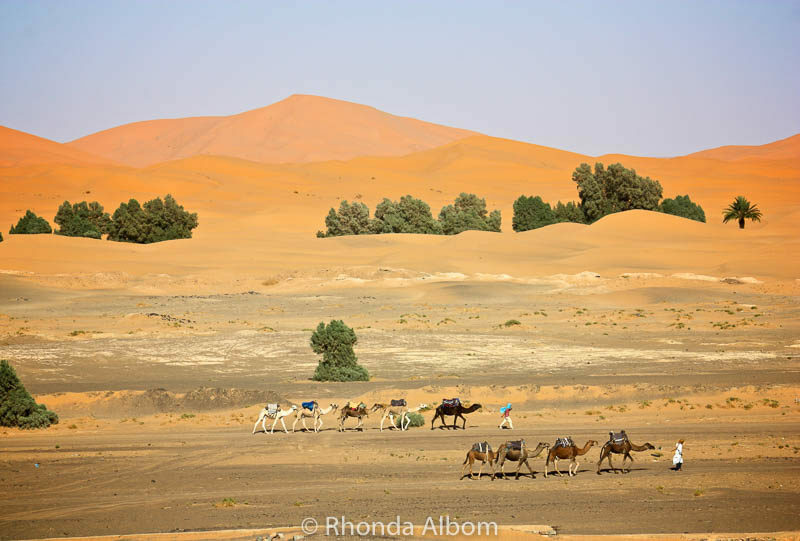 As we drove through the flat portion of the desert we saw several wild camels in the Sahara on the side of the highway. We also went dunes bashing, although for this we opted to have a driver. Wild Sahara desert camels were a typical road scene. We had a driver/guide when we went into the sand dunes, and we still got stuck and had to dig out. The Kasbah Azalay Merzouga was our farthest accommodation to the east as we travelled across Morocco, although on one day trip we were close enough to see the Algerian border. In Merzouga, we enjoyed the eastern Sahara. Our adventure in the Sahara included sand skiing, sand dune bashing, fossils, eating dates and more. The colours of the Sahara sands painted the perfect backdrop for this classic moment as the camels were walked by. Beautifully decorated with views like the one in the photo above shot from the kasbah property, the Kasbah Azalay Merzouga has a pool for relaxing and offers a variety of activities from a half day Sahara desert tour to Morocco camel trekking and even sand skiing. As we began our journey back to visit Marrakech one more time and return the car, our first stop was in Rissani. 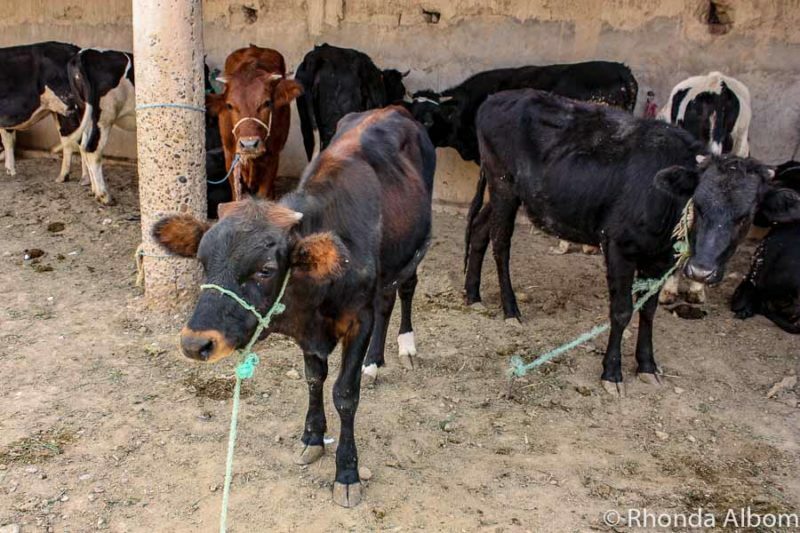 A few hours in this traditional town allowed us time to attend a livestock market. We saw cattle, sheep, and goats at the livestock market. Heading off the main road, we came upon a local produce market. It was different from the markets that cater to tourists for a few reasons. First, it only sold produce. Second, there were no fancy stalls or tables. Thirdly, the shoppers were all locals. 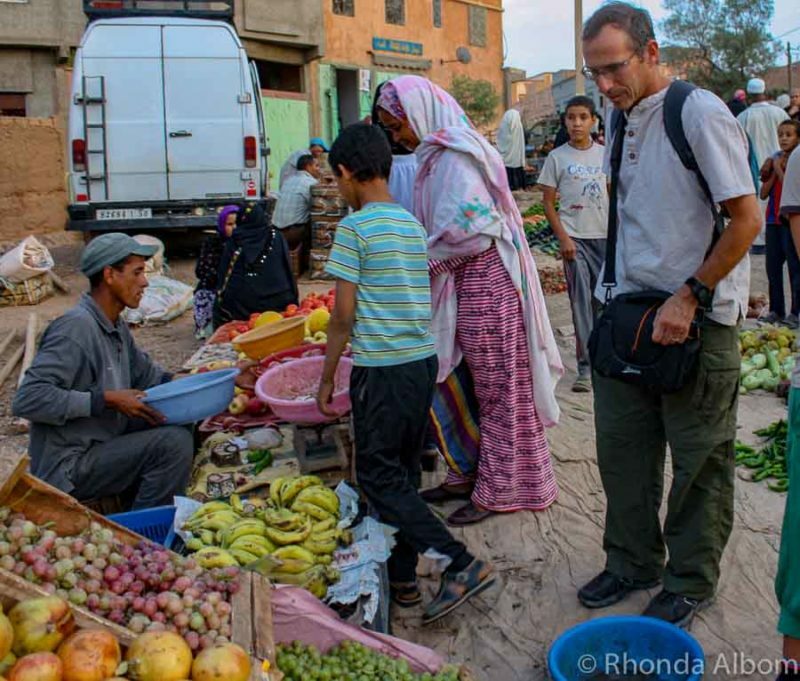 We stumbled upon this market in eastern Morocco. One of the more unique stretches of road we travelled through were Todra and Dades Gorge. 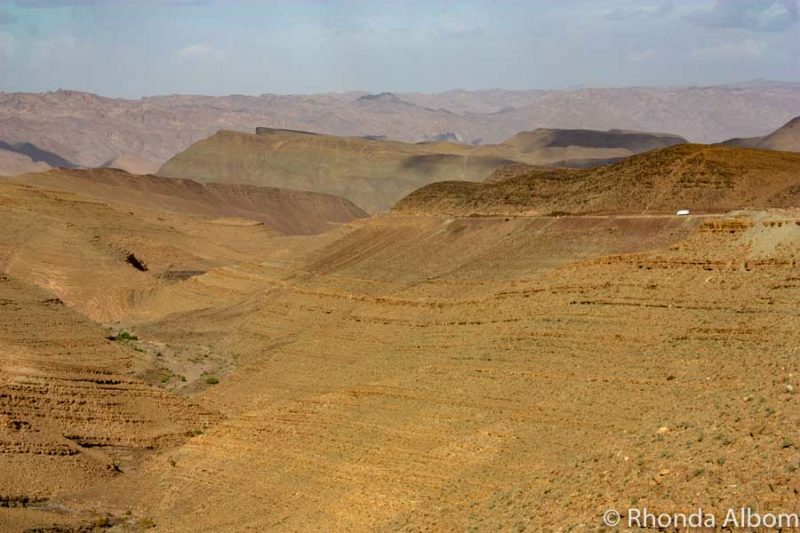 Both are limestone canyons, carved by the Dades River and wadis coming down from the High Atlas Mountains. First, we wound our way up through the Todra Gorge. At the top, there is a cafe with a balcony that is the ideal place to take a photo. The road winding through a section of Todra Gorge. A section of the Dades Gorge. Ouarzazate is most known for the movies made here. We opted to skip the tourist movie set but did pick a restaurant from our Lonely Planet Morocco book for lunch. Over-priced and a bit touristy, I am guessing it lost some of its charm after being featured. 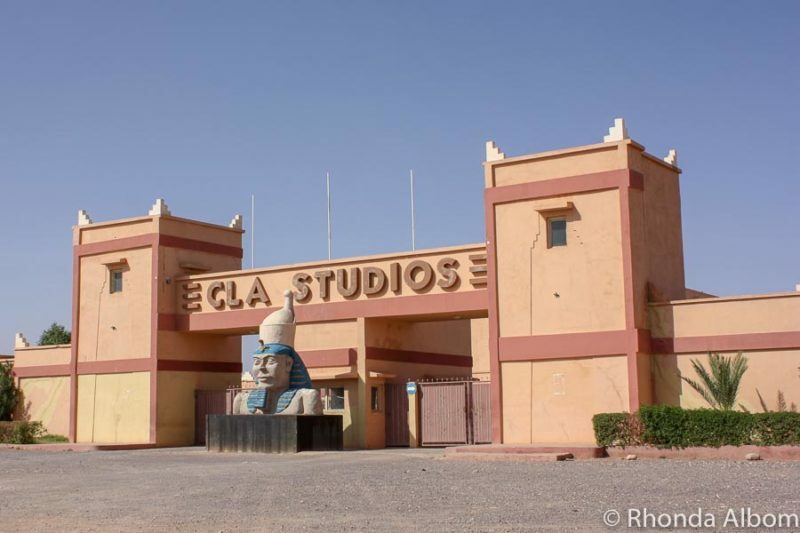 CLA Studios in Ouarzazate is where many of the movies filmed in Morocco are made. Pro Tip: If you don’t want to drive, you can take a Tour of Ouarzazate and Ait Ben Haddou from Marrakesh with Road of the Kasbahs. 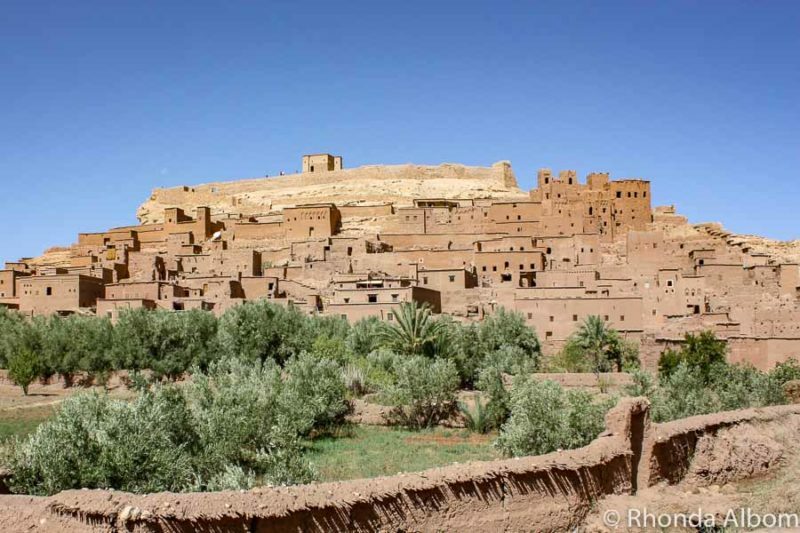 If the Ait Ben Haddou Kasbah looks familiar, it might be because you saw it in a movie. It has been used as the setting for a long list of movies including Prince of Persia, Gladiator, Jewel of the Nile, and The Mummy just to name a few. Ait Ben Haddou Kasbah is a UNESCO world heritage site. People still live here, therefore it is strongly recommended to have a guide if you plan to wander through the grounds. The guides are easy to find outside the Kasbah, and the price for a tour was quite reasonable. Our guide actually took us into his home and showed us personal items like the “weapon” he held as an extra in the movie Gladiator. Kasbah in Ait Ben Haddou. 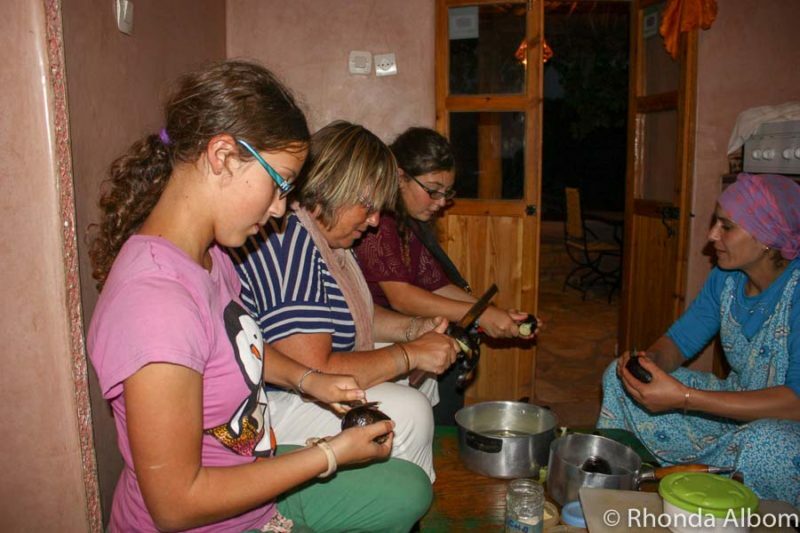 Today we made bread, peeled onions, chopped vegetables, and prepared dinner alongside a Berber family at theRiad Dar Isselday. The “simple life” is anything but simple. Learn more about the Berber people on Wikipedia. First, we began the process of making bread. It involved mixing, kneading, rising, kneading, raising, shaping, stacking and then we carried the formed dough out to the wood-fired oven, which is fire-heated and the bread is then placed directly on the coals. Putting a bread into the wood-fired oven. Intermixing bread making and the rest of the meal, we learned how to make the tagine, the salad and the desert while the bread dough was rising. 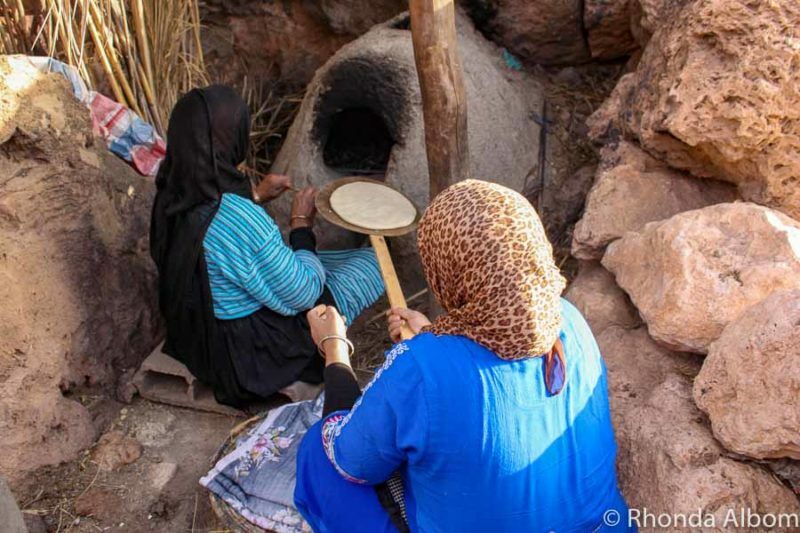 The Berber women don’t use a cutting board, but rather cut all the vegetables in their hands. She was so fast, and we were cautious and slow – and successful, no cut fingers. An hour or so of cooking and we had a fantastic dinner. 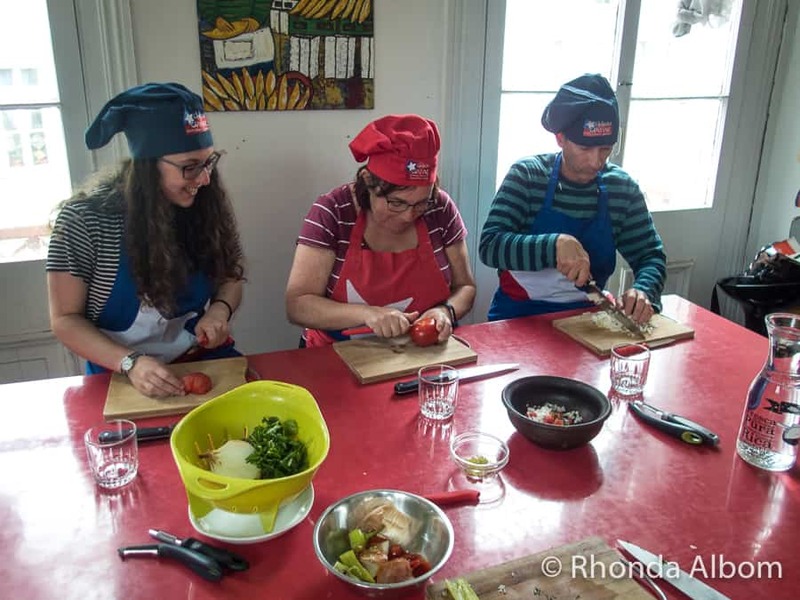 Learning the Berber way to chop vegetables. 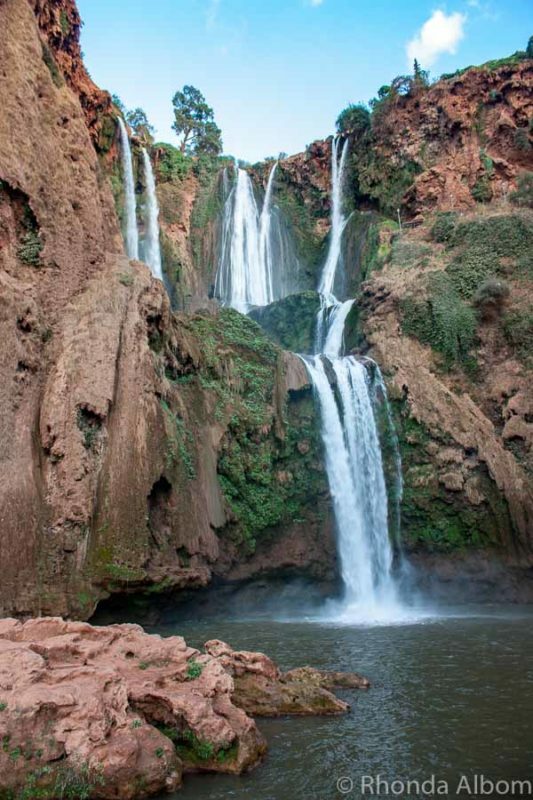 Just 150 kilometres north of Marrakesh by car is the largest waterfall in Morocco (and the highest in North Africa), a 110-metre drop waterfall called Cascade D’Ouzoud. The hills surrounding it are loaded with greedy little Barbary Macaques. They are old world monkeys, a species of macaque found outside of Asia with a vestigial tail (different from the macaques at Batu Caves in Malaysia). Cascade D’Ouzoud – while beautiful, they don’t compare to our favourite waterfall – Iguazu Falls at the Argentina and Brazil border. Barbary Macaques, like many wild animals, are adorable but should not be touched. They can, and do, bite. Plus, like the similar species in Gibraltar, they steal things from unsuspecting tourists. Barbary Macaque near Cascade D’Ouzoud. If you take a look at the table and chairs in the background, you can get a feel for how close the animals come to people. 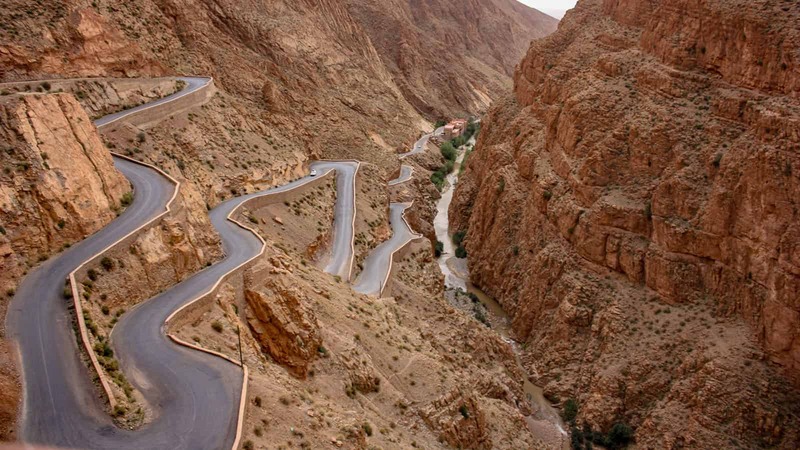 Pro Tip: Cascade D’Ouzoud is often visited as a day trip from Marrakech. 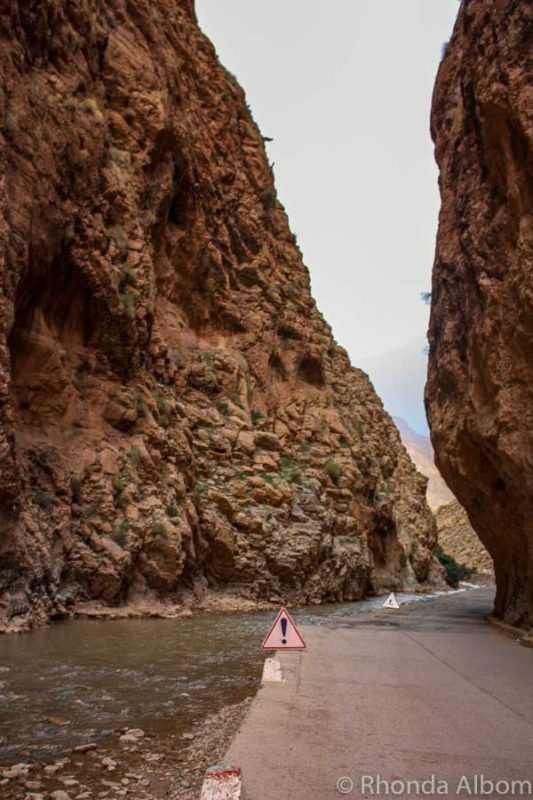 If you don’t have a car, you can join into this tour: Ouzoud Falls Day Trip from Marrakech from Viator, a Tripadvisor Company. Delightful bungalows, fabulous views of the mountains and only a five-minute drive to the waterfall, La Kasbah d’Ouzoud is the perfect place to stay. We rented a car with a handshake deal, through a friend of the owner of Riad Lena (where we stayed in Marrakech). It turned out fine, but we were lucky. In retrospect, I think I prefer paperwork, especially if things go wrong. Worldwide, we have been successfully using rentalcars.com. As an aggregator, they offer cars through local dealers at an equal or lower price than going direct. Rentalcars has its own customer service, therefore there is always an English speaking person if an issue arises. To date, our problems have been minor (once our auto air conditioning stopped working and a replacement car was provided, and another time there was an overcharge which was corrected). Driving in Morocco is easy, however, we did get pulled over twice for ridiculous things. We were advised that it is okay to offer a cash payment significantly lower than they are asking, or to simply say, “That is too much, can I pay less.” Don’t be surprised if the money goes into a pocket and there is no paperwork to follow. If you insist on paperwork, the fine will be much higher. We rented a car in Marrakech and drove the route highlighted on the map. 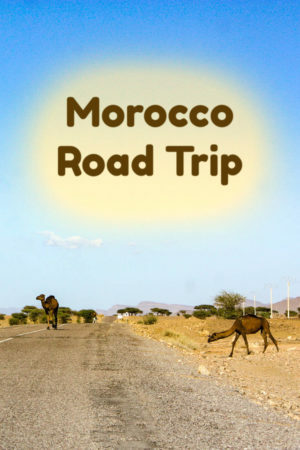 Our self-drive Morocco itinerary included the following stops, with the overnight stops in bold text. Have you enjoyed a road trip in Morocco? I’d have to go to the Studios just for the kookiness of it!! There’s a rally that goes through Megouza – amazing to watch. Great shot with the lightning too. These types of pictures are NOT easy to capture. I am intrigued as to how long it took for you capture these. Thanks John. It was a tripod photo – ISO 400, f/22 6 seconds, with a wide angle 18mm lens. Wow…great timing and just beautiful photos. I love that first picture. We’ve only managed to capture lightning on video and one of these days hope to be as lucky as you. But, capturing it in Morocco makes it even more special. Amazing photos Rhonda. I love storms, love thunder and lightning as long as the lightning is in the distance. Constant lightning isn’t good for me to look at due to seizures that I picked up when I had my stroke but seeing them in your photos are beautiful. Great job my friend. Have a lightning Thursday Rhonda. See ya. That sounds really scary Paul. At least you can enjoy my photos. I have so many great memories from Morocco. You are so lucky to get a picture of lightening. I’m always a day late and dollar short on that one. We don’t see lightning in New Zealand very often, so I really wanted the shot during the storm. I can feel the power! Amazing shots. I am always scared of storms because I have experienced flash flood! And this photos gave me chills but they are beautiful. Nature is always powerful and beautiful like these photos. We experienced flash floods in Oman. It was really scary. This storm wasn’t too scary, as it was mostly in the distance. Thanks Lexa. I love the date palm trees in Morocco – especially the dates. I love to watch the lightning. I hadn’t captured it in a photo before. What gorgeous shots! I’d love to capture a storm but I just am not quite ready for that set-up yet. Soon though! Stopping by from Steph’s Joy! It’s about patience as well as preparation. Thanks Charlotte. Use a tripod, slow shutter and a shutter release cable. Wow, that’s a beautiful picture! The way the lightning strikes that mountain is striking! I think it was behind the mountain, as it tails out the other side. WE don’t get much lightning or thunder so I never thought about taking photos during a storm. I would, however, be sitting and waiting if I knew a scene like yours was coming! Living in New Zealand, I sometimes miss thunder and lightning storms from when I lived in the States, or when we travel. 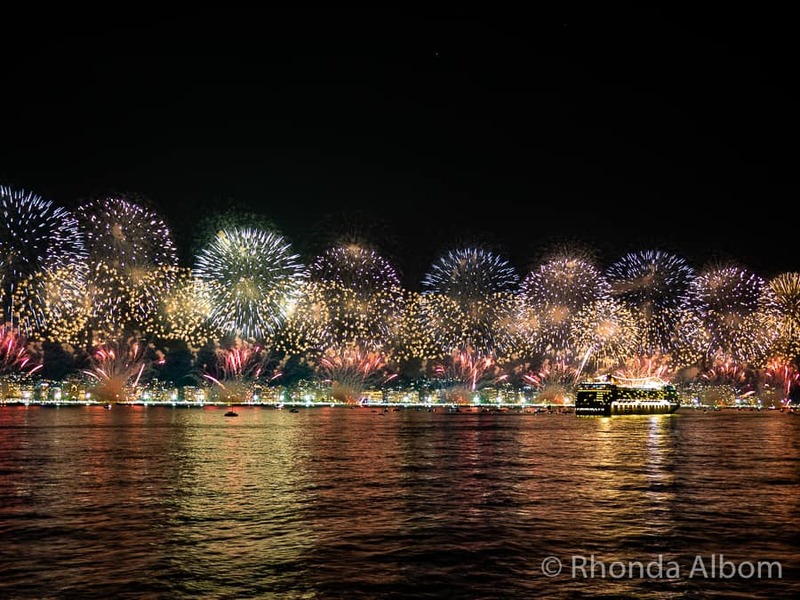 Amazing shots Rhonda! I have sadly not been to Morocco. Morocco was one of our favorite countries when we went around the world. I hope you get there some day. Wow! 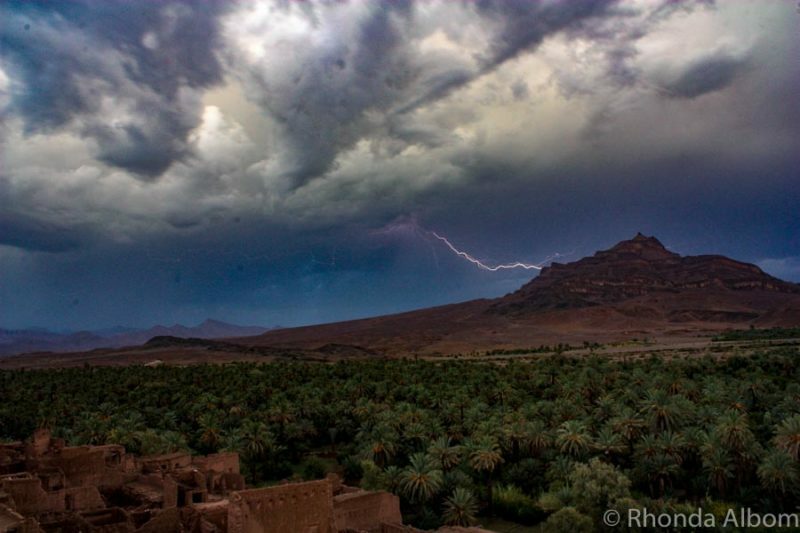 Great pictures Rhonda – I find it hard to capture lightning t¨like that. 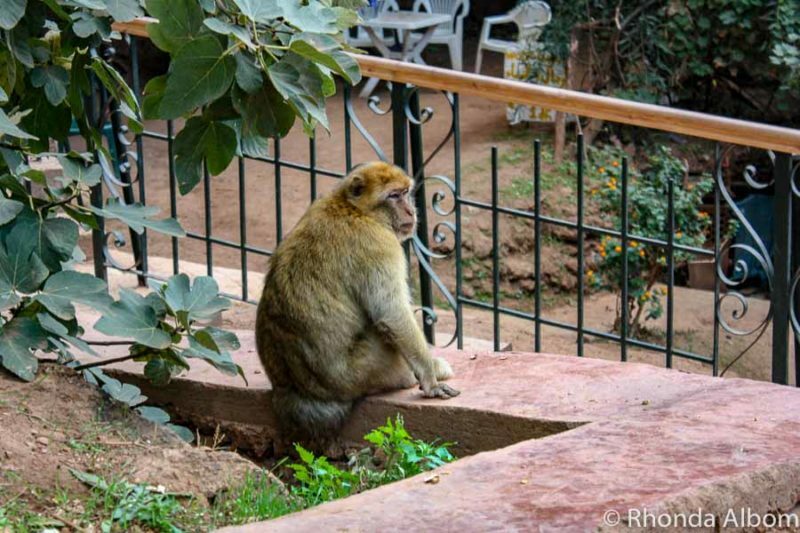 never been to Morocco …. Thanks Eli, Try a tripod, a slower shutter speed and a shutter release cable. great captures. I have never ever managed to capture storm. Amazing timing on that first shot! Hello, beautiful views and awesome captures of the lightning! Have a happy week! It was really pretty there among the date palms. I’d be happy for any kind of rain. It’s ever so dry here. Sorry you are still in a drought. Hope it rains soon. At least the winter is coming, that should bring some rain. As for Morocco, I don’t image it being on your bucket list, but I loved it. Wow – those shots are amazing! Lightening is always fascinating—-at a distance. Great photos! Yes, the distance is key. I’ve never been able to catch lightning with my camera. Congratulations! Slow down your shutter, use a tripod and shutter release cable. Gorgeous shots! Lightening is so hard to shoot. Never been to Morocco, but we are lucky (unluckly?) enough to live in a part of the world with spectacular thunder storms. We rarely get lightning in New Zealand, so I find it mesmerising when I see it in other parts of the world. That’s brilliant capturing that lightning strike Rhonda, though I don’t like being around storms I like the photos the second one is the calm after the storm. Actually the second one also has a bolt of lightning, just not as pronounced. I don’t generally take photos if I am in the storm, as it will hurt my camera. This one was in the distance, heading to us and then passing over. My shots are of a storm in the distance.